I last covered Eventail in April 2018, when its developer Jozef Legeny brought support for the iPhone X and new color schemes to his compact calendar widget for iPhone and iPad. With version 3.1 released today, Eventail (which over the past year also gained support for overdue reminders and interactive mode) is adding integrations for popular third-party apps and a convenient shortcut to reopen links contained in events and reminders. As I argued last year, what sets the Eventail widget apart is the ability to fully customize it so that each day column can display a set of calendar events and reminders defined by you in the app's preferences. You can tweak the number of columns to display at once, which calendars and lists to fetch items from, and even adjust colors and fonts to your liking. In the Pro version of Eventail, available as an In-App Purchase, you can enable interactive mode, which lets you drill down into individual days displayed in the widget to reveal actions for each event or reminder, such as opening directions for a location contained in an event or completing a reminder. In version 3.1, among the actions supported in interactive mode you'll also find buttons to view a reminder in GoodTask, Fantastical 2, or Memento. As a heavy GoodTask user myself, this is a fantastic change: with a couple of taps, I can jump from the Eventail widget to a specific reminder loaded in GoodTask, which will open with the screen I selected as the default one for a single-reminder view (the Quick Actions screen). I'm not aware of any other Calendar/Reminders widget that lets you mix and match apps like Eventail; I only wish that, as far as calendar clients are concerned, Eventail also supported Calendar 366 and Week Calendar in addition to Apple Calendar and Fantastical 2. The second notable improvement in Eventail 3.1 is another nice one: if an event or reminder contains a URL, there will be an icon in the widget to instantly reopen it. In the case of local URL schemes (such as evernote://), you'll see an App Store button; for standard web links, you'll see a Safari-like glyph. I often embed both URL schemes and web links in the note field of my reminders (GoodTask makes it easy to reopen them thanks to its quick actions), so I'm happy that Eventail is going to save me a few seconds to reopen links from anywhere on iOS. 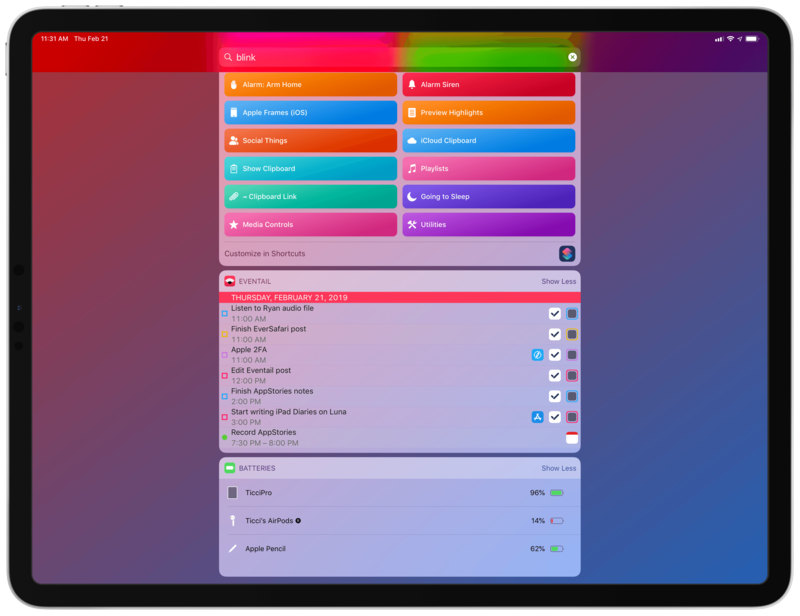 If, like me, the comfort of Apple's ecosystem and the release of the HomePod last year pushed you to embrace iCloud calendar and reminders but you still want to be able to use more versatile third-party apps for them, you should take Eventail for a spin. The app provides a unique blend of customization and native integration with the system Calendar and Reminders apps, and it's now better integrated with third-party clients as well. Eventail 3.1 is available on the App Store here.